In order to insert the Facebook Pixel on your site you just need to add your Facebook Pixel ID in the dedicated field. You will find the pixel ID field on the plugin General tab. Remember to click the “Save Settings” button once you’re done. 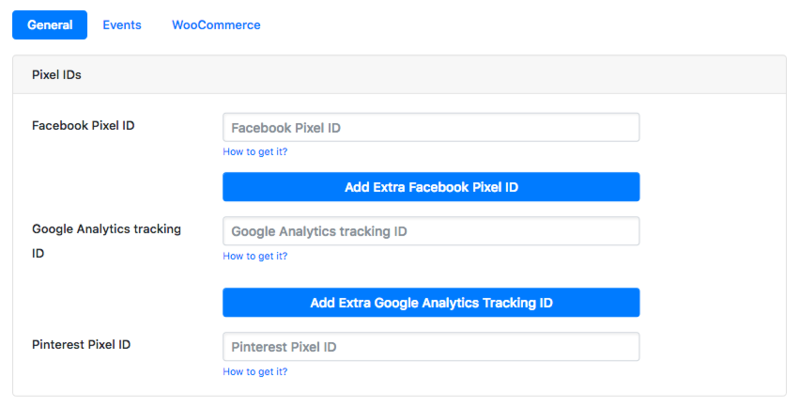 You can find your Facebook Pixel ID in your Facebook Ads account, by clicking on the Pixels Link. If you already have your pixel generated you will see it. Simply copy the ID and paste it in the dedicated field inside our plugin. If you don’t have any pixel, you will need to generate it. Go on the Pixels Page and click on the “Create a pixel” button. Skip any suggested integrations, because PixelYourSite will do this for you. Simply copy the pixel ID, once you have it. It’s possible that you will see a message saying “Finish setting up your Facebook pixel“. Ignore it, because it will go away once Facebook starts to get data from PixelYourSite. It can take a while before the data is updated by Facebook. It’s also possible that you have more than one pixels. Make sure you use the one you really want. NOTE: With the Super-Pack you can fire multiple pixels on your site.